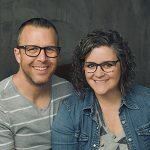 While John Johnson is one of the more recent additions to the resource center staff at Global Strategy, cross-cultural ministry has been his passion and the Johnson family’s passion across many years. John currently coordinates Native American Ministries and Disaster Relief for Global Strategy and Church of God Ministries. John and his wife Gwen have been involved in cross-cultural ministry and missions with the Church of God since 1980. They have lived in Korea, Egypt, Lebanon, on the island of Guam, back in the United States, and until recently Vietnam. While in Korea, Egypt, and Lebanon, they served as cross-cultural disciple-makers with a concentration in leadership formation with the Church of God. While on Guam, they served as the Global Missions regional coordinators for Asia and the Pacific. From 2006 until 2014, John took a break from cross-cultural ministry to inflict his quick wit and puns on students at Warner Pacific University, in Portland, Oregon, where he was a professor of ministry and missions. John and Gwen then returned to cross-cultural ministry, serving as site pastors for the MyDinh campus of Hanoi International Fellowship in Hanoi, Vietnam.